I have previously discussed the issue regarding the persistence to make mech work, and why I am not a fan of that direction. I never bought into Blizzard’s argument that the mobility of Tankivac was the reason for the lack of mech in TvT, and I believed that mech will slowly become an option as time goes by. The recent resurgence of mech seems to suggest I may just be right. There was a balance patch in the last two months, and these are the changes to the Terran units. When you look at the recent games that have at least one player using mech (see vods above), none of the changes in the patch seems to matter. Thor is not used, and Cyclone has very little impact. Liberator is an important unit, but the anti-air damage nerf has no effect in mirror match. Therefore, in line with what I have speculated in the beginning of Legacy of the Void, mech indeed became an option after the players’ understanding of the game has improved over time. Thanks for the email to point out that I read the Liberator change the wrong way. I actually read the results of one of my experiments at work the opposite way on the same day of this post too. Liberator’s anti-air change makes it weaker against Vikings in the mass air battle in the late game. This explains the emphasis on producing Vikings for both for sides if one of the players decides to go mech, which in turn will shift the focus to air advantage. Based on this small sample of games, it is hard to be conclusive on how the composition works out in the match up in Legacy of the Void. However, as counter intuitive as it sounds, the mech composition may be less Tank-centred than it once was. I will use the game between Maru and Reality as a starting point, as it is probably the most “standard” of these, in which, it is a macro game between mech and bio. In the early to mid game transition, Maru focuses on producing from a Reactor Factory and a Reactor Starport, and the focus is on Hellion and Viking (see image below). This composition is very mobile and has good map control, and more importantly, it is very hard for opponent to attack. If the bio player pushes out, the hellions can kite and chip away the Marines, while you have time to produce a Tank or two. The Vikings give you the vision advantage in Tank versus Tank, and they neutralise the mobility of Tankivac. Moreover, the Vikings make it extremely hard to be cost efficient to drop at the earlier stage of the game. Dream had the same set up against Forte (see image above). Although Maru took an early third while Dream went for seemingly more common approach, this may just be the new mech convergent point. 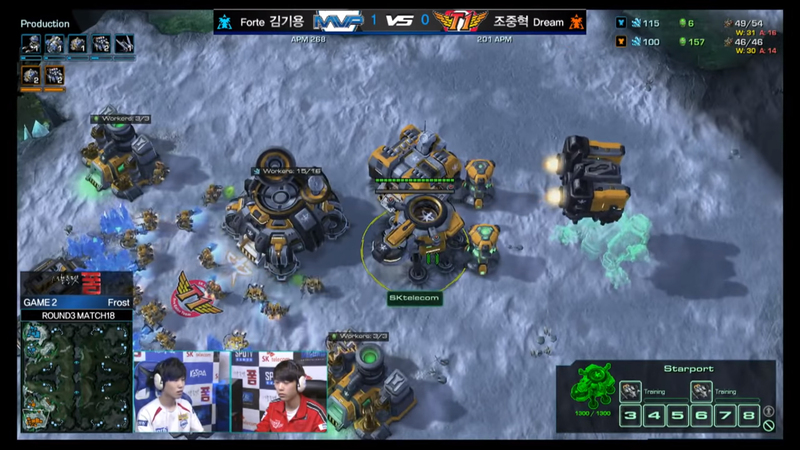 The Vikings’ ground attack basically won Dream the game when he saw that Forte was not producing Vikings like he did in mech mirror. Let’s move back to the game between Maru and Reality. As the game proceeds to the mid game, the key is whether Reality, as the bio player, decides to switch to a sky composition. In the first notable professional TvT game that involves mech, the bio player transited to sky Terran with Liberators and Vikings. Such composition switch is also observed in this game, and you can tell that Maru is actively looking out for it with scans (see image below). It is usually the bio player who has the priority to decide whether to switch to the sky composition, because the mech player may get overwhelmed by bio if s/he switches out too early and has nothing to deal with the ground force. The other reason is that it is a lot harder for mech to proactively trade away the army to make space for the transition. In the game, Reality did some nice moves to trade away his bio, and transited to sky accordingly. This is as textbook as it gets, but it is what happens next that is interesting. 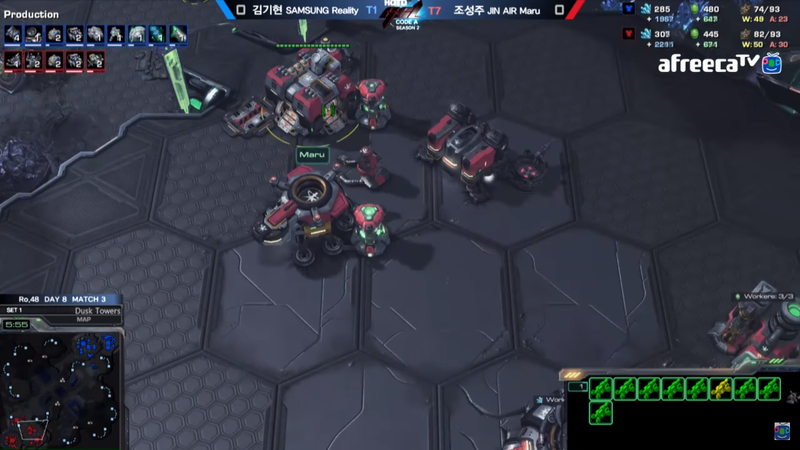 Maru did not just try to match Reality’s air units with more air units, but he also made lots of Widow Mines. This move is in fact not new, as we have seen FanTaSy did it versus Flash in Heart of the Swarm as a reaction against sky Terran in 2013. Someone needs to buy me a cookie for remembering this game, and digging it out from youtube (see vod below). Another thing to remember is that mech has a weaker upgrade advantage for the sky composition transition in Legacy of the Void than in Heart of the Swarm. In Heart of the Swarm, the attack and armor upgrades of Factory and Starport units are combined, and hence, the mech player will always have a significant advantage in upgrade in a sky transition battle. In contrast, only the armor upgrades of Factory and Starport units are shared in Legacy of the Void, so the upgrade advantage for the mech player is weaker now. There are other less telling games that involve mech, and both are played by INnoVation (see vods below). 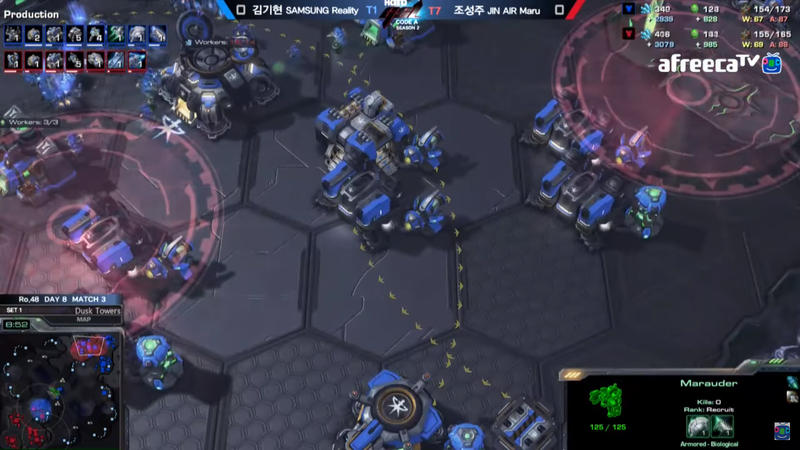 INnoVation used a two base timing with Hellbats against Ryung, so it is hard to tell how the game will played out into the mid and late game. As for the match between INnoVation and GuMiho, I got to say I just kept shaking my head when I watched it. The early game basically sealed the deal, and the rest is snowballed. A month ago, INnoVation had also used mech against TY (see vod below), but the game was a little too messy to draw much information from it. TY wanted to do a Tank push with Vikings, and did not expect INnoVation to use mech. TY delayed his Stim, but didn’t get the advantage he wanted for the trade off. Subsequently, it landed in a weird base trade situation that wasn’t in his favor. One thing for sure though, Viking is the key. Why do I say we should not be overly optimistic about mech making a come back at the start of this post? This is because none of these games has convinced me that mech is more effective than bio. However, if both players (Dream and Forte) chose to use mech on a map like Frost, it shows that the players are confident that mech can work. Let’s wait and see how this develops in the next few months.